Beautiful things, thoughts, and stories from my life. Yesterday, I had an appointment for a facial and massage. It was a special: $89 for a 45 minute facial and a 45 minute massage. The massage came first. When I got there, I was fit to be tied-- I have been feeling like this for a few months now; incredibly "boxed in" and like I'm at a dead-end in life. There is so much that I'm feeling, and it's entirely valid, but I don't feel that it's valid, or better, perceived to be valid. Maybe it's how I think people would perceive what I'm going through. Maybe it's that I cannot even fathom that I'm feeling like this. Why would I feel like this, I have everything I've ever wanted, right? Ugh. I'll go into this a bit later. Back to the massage. Her name was Fay. I haven't had a massage in months, maybe a year? Fay was kind, yet I immediately felt my defenses go up that screamed "leave me alone". Before she left me to get undressed, she asked if there were any specific areas I wanted to work on. I told her that my hips, and lower back have been painful lately, and that I've been stressed, and I just "need this". (Again, I'm trying to make my feelings valid. Why am I doing that?) . She said "You came to the right place". and left me so I could get settled. About 5 minutes into it, with my face in the face pillow, I started to silently cry. To have someone paying attention to me, focusing on me, instead of me desperately trying to pull information or conversation or feelings or thoughts from someone else. It just felt good. Very good. As I started to cry, she said that she was also doing reiki on me. That made perfect sense. I have had reiki, but only by someone still training in it, and it was a very different experience then. This time, I felt like my soul was being healed or something. I told her I was crying (releasing), and that it made sense she was doing reiki. She was amazing. Not even half way through, I felt like an entirely different person. Calm. Peaceful. Serene. What we need tends to come into our lives. The Universe brings it to us, puts us in the right path at the right time. The Universe gave me bonus reiki when I thought I was just going to get a massage. She explained to me her beliefs, which are identical to my own: that we are here to learn something, and if we don't learn whatever lessons we are supposed to learn, we will have to come back again and again. She also explained the chakras to me, and said that two were blocked, one being the root chakra, where the pain I have been feeling is. The other was my throat chakra, which makes sense too: there is a lot I want to say, even to myself, for which I cannot find the words. I feel lost, like an aimless balloon floating through the sky untethered, while at the same time, I feel TOO tethered, like there is no wiggle room, there is no way to do what I want to do. I told her I have been feeling like I'm in a cement box, and energy cannot get in nor out. I used to be great with Law of Attraction and going with the flow and understanding energy, thoughts, feelings, letting go, focusing, etc. Now I feel like I'm stuck in a cement box. She reminded me that if I say/think I feel like this way, if I believe I feel this way, if I believe that I have no options, no voice, no movement, that that is what the Universe will give me. I say "reminded" because I KNOW THIS. I just needed to be reminded. Now, if I could just get back to actually believing this, I'll be good, but it's hard. Very hard. I am newly married, 9 months ago tomorrow, as a matter of fact. I have two amazingly gifted, beautiful bonus kids. Since I've been in their lives, I have tried extremely hard to build something. Anything. I feel like I'm making no headway, as if I'm building a bridge on sand, and every piece I add just sinks the ones before it and I have to start over. I just want to be let in. I just want them to want me to be a part of their lives. Instead I feel temporary, or that they see me as temporary, and even unnecessary. My husband feels that we are a family. I feel this way at times, too, but it's waning. They are teens-- did I mention that? Yes, I know, I know, that explains it, pure and simple, one word: teens. But for a woman who has always wanted kids, and has longed for their love, has longed for a family her entire life, it's painful to say the least. A major issue that does not help is when I try to talk to my husband, about this or many other things, he chalks up my words and mood as hormones. It seems to be the catch-all phrase, and has been for a few months. On the flip-side, I know my tone doesn't help, but when I'm always met with the same response, it's hard to not have a tone. 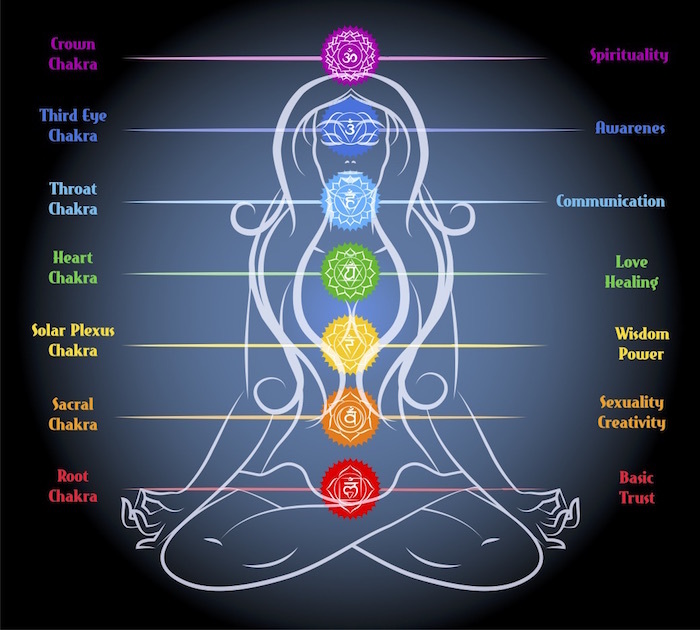 Those chakras, my blocked chakras: The Root Chakra (trust) and the Throat Chakra (communication). This was an eye-opener. I need to somehow convey to my husband that what I am saying and feeling is real, at least it is for me. It may not be real to him, but it's my reality, and not just hormones. I think that catch-all phrase is the cement box I have found myself in. Sometimes I feel as if I've found myself in a cliche, 1950s scenario of not being heard or understood. Another trust and communication issue I have is with myself. I am not currently working, but looking for a new job. I'm an "office-worker", a basic whatever who manages offices, manages schedules, manages executives. But I have such dreams and longing for something of my own. I know exactly what that something is. I'd be good at it. A big chunk of my professional and personal background is the exact experience needed for this. I just need to save up the money to get it started. I can't do that without working. In the meantime, I'm trying to find something. And, at the same time, trying to help my husband start his own thing. Once he's off the ground and running, maybe I can do the same for me. Just like a woman: taking care of others first. Is that good or bad? I don't know anymore. I need to remember a very important piece of advice that I have given other women countless times--- I need to put my own oxygen mask on first before assisting others. I have one more appointment with the massage therapist. She's moving back to the Philippines next month, and I want another session. Maybe even two. Maybe she can recommend another reiki practitioner to me. Fingers crossed. I'll be back to post updates on everything: the next reiki session, the breakthrough I intend to have in communicating with my husband, and with the teens (not holding my breath on that one), my dream business, and many other items which all seem to be on the front burner these days. Is There A Dead Witch Under My House?